Dr. Cynthia Maxwell received the PGME Award on Thursday March 2nd, 2019. 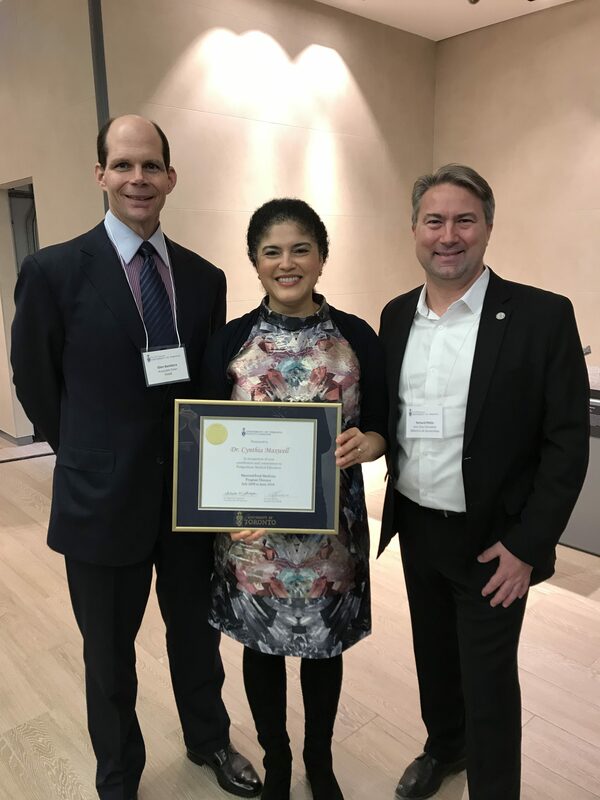 It was presented by Dr. Salvatore Spadafora, Vice Dean Post MD Education at UofT in “recognition of contributions and commitment to Postgraduate Medical Education” as Program Director for the Maternal Fetal Medicine Fellowship Program 2009-2018. During her time as program director she oversaw training of over 100 fellows from Canada and internationally, as well as many elective trainees from other MFM fellowship programs, subspecialty residents in paediatrics, internal medicine, ob/gyn, as well as undergraduate students and observers. Dr. Maxwell is pictured here with Dr. Glen Bandiera, Associate Dean PGME on the left and Dr. Richard Pittini, Vice Chair for Postgrad Education in the Dept of Ob/Gyn. The Post MD Education Appreciation event took place at the Hennick Family Wellness Gallery at Mount Sinai Hospital.